Hi! I'm super excited to share the card that I created for the Scrapbook Adhesives by 3L and Quietfire Design Blog Hop today! Christmas is such a special time of year. I like to put a lot of extra love into my handmade Christmas cards. I had a lot of fun adding foil to embossed cardstock and painting a metal die-cut sentiment for the front of this card. Inside the card is a special stamped message and a foil accent strip. 1. Emboss a piece of white cardstock with a festive A2 embossing folder. Note: I used the Couture Creations Sugarplum Ball Embossing Folder, which features a holly and berry design. 2. 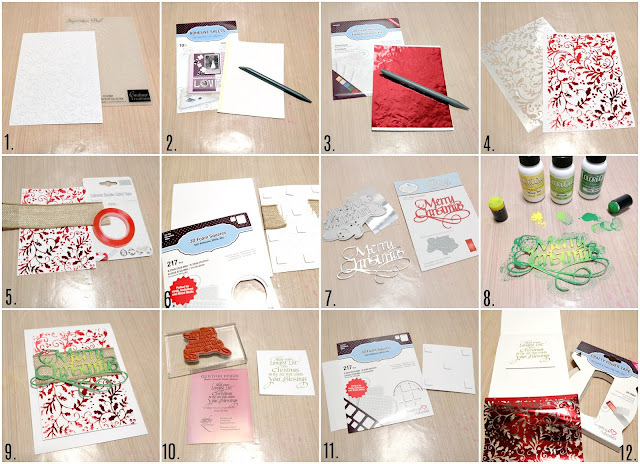 Apply adhesive to the raised areas of the embossed cardstock by placing an Adhesive Sheet over the paper and rubbing over the surface with a stylus. Save the used Adhesive Sheet for Step 9. 3. Apply red foil to the embossed cardstock. Place a sheet of red foil, colored side up, on top of the embossed cardstock and rub over the surface with a stylus. 4. Lift the foil sheet from the cardstock. Trim about a quarter of an inch from each side of the embossed cardstock. Note: The foil transfers only to the raised areas of the embossed cardstock that were covered with a layer of adhesive. 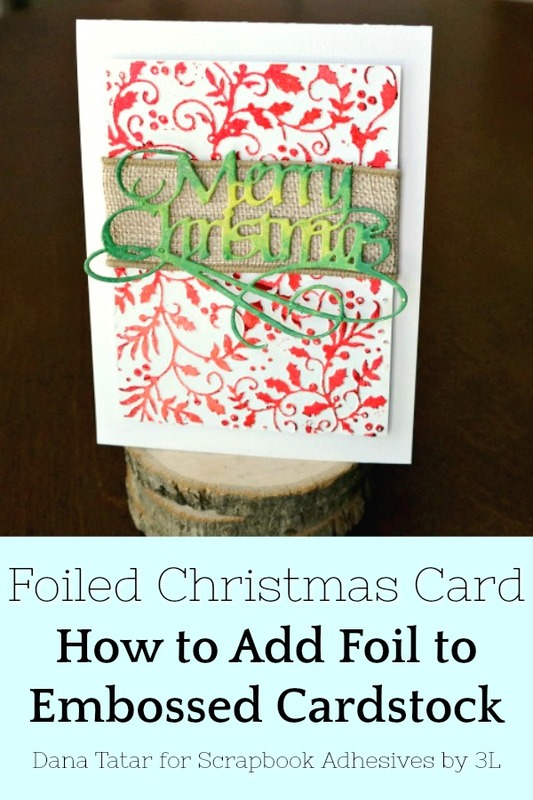 Save the used foil sheet for Step 12. 5. 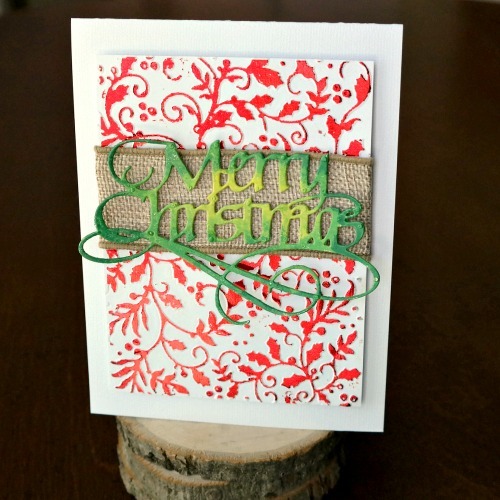 Use Home and Hobby Extreme Double-Sided Tape to secure a piece of burlap ribbon to the foiled cardstock. 6. Apply 3D Foam Squares to the back of the foiled cardstock. Stick the foiled cardstock onto the front of a white card base. 7. Wrap a piece of thin cardboard with foil tape. Use the Quietfire Design Merry Christmas Metal Cutting Die to cut a sentiment for the front of the card. 8. Color the foil tape die-cut sentiment with ColorBox® ColoriQue Ink by Lisa Marie Jimenez. Note: ColorBox® ColoriQue brings artistic color to metal with one-coat coverage. ColoriQue ink also adheres to wood, glass, clay and more! Visit Lisa Marie’s Etsy Shop to purchase ColoriQue. 9. Rub the Adhesive Sheet from Step 2. over the back of the die-cut sentiment. There is plenty of adhesive left on the sheet to help attach the die-cut to the front of the card! Center the die-cut sentiment over the burlap ribbon. 10. 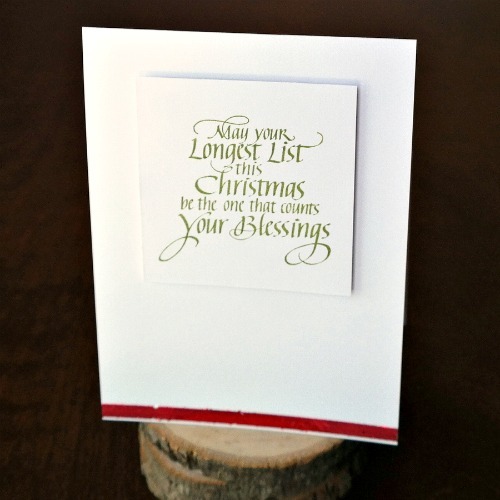 Use the May Your Longest List This Christmas stamp with green archival ink to stamp a sentiment onto a 3x3 inch piece of white cardstock. 11. Apply 3D Foam Squares to the back of the stamped sentiment. Center the sentiment on the top half of the inside of the card. 12. Cut a piece of Crafty Power Tape to fit across the bottom inside edge of the card. Use the Foil Sheet from Step 4. to apply red foil over the strip of tape. Thanks so much for stopping by today! 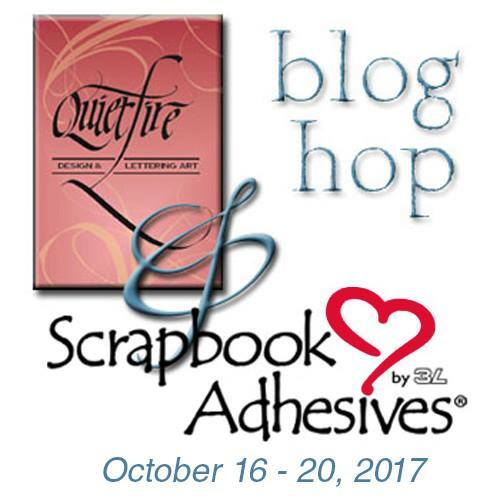 Be sure to visit both the Scrapbook Adhesives by 3L Blog and the Quietfire Design Blog every day this week for more inspirational projects and details on how to enter the giveaways! There are three $25 adhesive prize packages and a $25 Quietfire Design gift package up for grabs! Home Hobby Extreme Double-Sided Tape - 1/4"
This is gorgeous!!!!!!!! LOVING the colors and textures!!!!!!!!!!!!!! !